NEW for 2018!!! Cash prizes for top three winners overall - both male and female - $100; $50 and $25 each. When you participate in HMEA’s incredABLE Run, Walk and All-Day Family Fun, you give hope and help to thousands of people with Autism and other disabilities who live, learn and work in our communities. 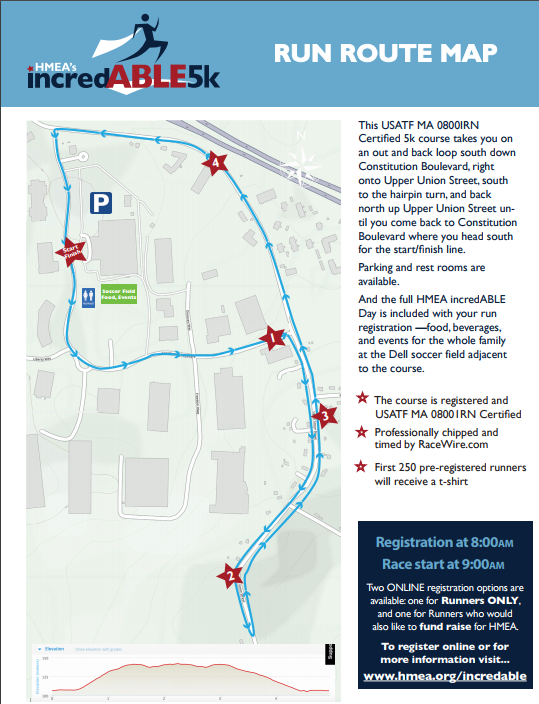 The 5K course is registered and USATF MA 08001RN Certified. Professionally chipped and timed by RaceWire.com. T-shirts, refreshments and prize bags available while supplies last. The race kicks off at the headquarters of DELL/EMC2 in Franklin, Massachusetts. The course is flat, along back country roads and park-like settings. The course is considered “easy” and perfect for the first-time competitive runner. For those experienced runners, the course can help you condition and improve your personal best times. Kids can participate in a two-tiered fun run. Strollers, wheelchairs and motorized carts are also welcome to participate. Easy access off 495 N or S. exit #17. Plenty of free parking too. The proceeds from this race benefits children and adults with disabilities such as autism and other developmental disabilities. I hereby for myself, my heirs, executors and administrators, waive and release any and all rights and claims for damages I may have against HMEA, The HMEA Independence 5K Race, The Town of Franklin,MA, The Franklin Industrial Park, Dell EMC Corp., sponsors, coordinating groups and any individuals associated with the event, their representatives and assigns, and will hold them harmless for any and all injuries suffered in connection with this event. I attest that I am physically fit to compete in this event. Further, I hereby grant full permission to any and all of the foregoing to use my likeness in all media including photographs, pictures, recordings or any other record of this event for any legitimate purpose.